At the base of the breathtaking McDowell Mountains you’ll find the remarkable community of DC Ranch. Located in North Scottsdale on 4,400 acres, DC Ranch is home to an abundance of truly remarkable homes and homesites. The picturesque views of the Sonoran Desert, the majestic McDowell Mountains and the expanse of sparkling city lights make DC Ranch a beautiful place to call home. 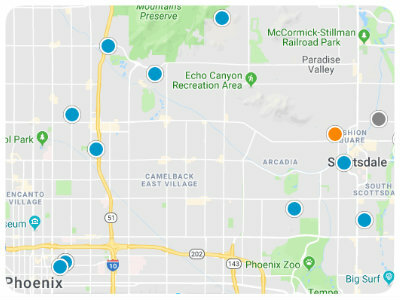 DC Ranch is comprised of four residential villages: Country Club, Desert Camp, Desert Parks and Silverleaf which together encompass 25 different neighborhoods. Each of these distinct villages has its own unique character and architectural scheme. Silverleaf is home to The Silverleaf Club and a plethora of social and recreational opportunities. An exclusive gated community, Silverleaf has a par-72 Tom Weiskopf-designed golf course with 7,322 yards of lush landscaping. Residents of Silverleaf also enjoy two swimming pools, six lit tennis courts, and more. The Country Club community of DC Ranch is home to a golf course designed by John Fought and Tom Lehman. The Country Club course is great for all levels and boasts subtle breaks, deep bunkers and breathtaking views. Residents of The Country Club also enjoy swimming pools, tennis courts and similar shared amenities. Homes for sale in DC Ranch include urban-hipster homes, stacked-flat designed homes, intimate cottages, multi-million dollar luxury estates and everything in between. Regardless of which community within DC Ranch you choose to call home, you’ll enjoy easy access to great shopping and dining at The Market at DC Ranch. The community also has multiple walking trails woven throughout its many neighborhoods. Silverleaf of DC Ranch is home to the smaller neighborhoods of Arcadia, Canyon Village, Canyon Villas, Horseshoe Canyon, Sterling at Silverleaf, The Bungalows, The Parks and Upper Canyon. The impressive Desert Camp Village of DC Ranch is home to the neighborhoods of Camelot, Desert Camp Villas, Market Street Courtyards, Market Street Village, Montelena, Pioneer, Rosewood, The Haciendas, and Market Street Villas. Desert Parks Village is home to the neighborhoods of Courtyards at Desert Parks, Desert Haciendas, Desert Parks Vista Apartments, Desert Park Villas, Park & Manor Homes, Terrace Homes East and West, The Estates and The Villas at Desert Parks Village. The DC Ranch community known as Country Club Village is comprised of the Columbia Community, Country Club and Tapadero neighbors. The average sale price for a home in Silverleaf is around $2.9 million. The average sale price for a home in Desert Camp and Desert Parks is around $662,000. The average sale price for a home in Country Club is around $1.7 million. If you would like to buy a home in the prestigious community of DC Ranch of Scottsdale, Arizona, please do not hesitate to contact us today.